35 years ago, Steve Jobs invited Ron Wayne to persuade Wozniak to join him in his entrepreneurial foray called Apple Computer Co. Jobs and Wayne go back a long way and had known each other from Jobs’s Atari days. 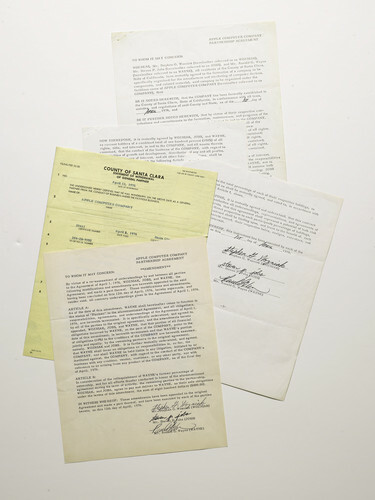 Wayne drafted the original four-page founding contract that established Apple Computer Co. on a typewriter and came up with all the legalese of their partnership agreement. Twelve days later, Wayne left the young startup and sold his stake. 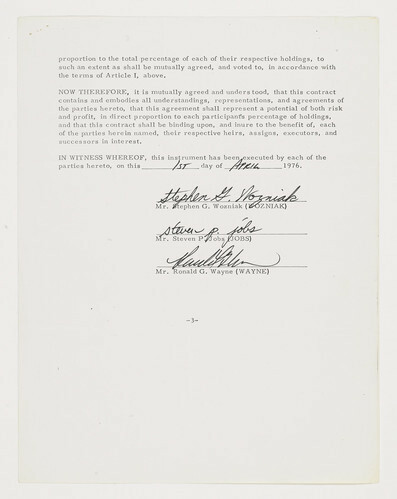 35 years later, the original founding contract goes up for auction at Sothesby’s and is expected to fetch a cool $150,000. Apparently the consigner bought the legal papers back in the mid-1990s “from a manuscript dealer” who is thought to had acquired them from Wayne, Sotheby’s Richard Austin told the publication. On April 12, Wayne withdrew as partner. The move is documented by a County of Santa Clara statement and an amendment to the contract, both of which are part of the Sotheby’s lot. Wayne received $800 for relinquishing his 10 percent ownership of Apple, according to the document. He subsequently received another payment of $1,500, according to Sotheby’s. Included right after the break is a video interview of Ron Wayne with The Next Web’s Matt Brian from September highlighting why he left Apple after just twelve days. One of the reasons is Wayne’s realization that he would be standing in the shadows of geniuses. The original legal document that established Apple Computer Company (left) and signatures of Steve Jobs, Steve Wozniak and Ron Wayne (right).